It’s my birthday! I know I should probably be more cool about it, and not say anything, but I’m like a big (rapidly aging) child when it comes to my birthday. I genuinely don’t want a lot of fuss, or presents or parties, but I have this feeling that I want something special to happen, but on some cosmic level. I know! It’s dumb! I’m 43, which is just absolutely crazy to me. How can I be middle-aged when I’m still waiting to feel like a responsible full-grown adult? I have to admit that turning 40 was harder for me than I expected it to be. Part of me felt like I was having a slow-motion mid-life crisis, with brief shard-like pangs of anxiety and melancholy. (I feel better this year, though! Not sure why!) I’m not indulging in this birthday whine for sympathy, but because one of the harder things, for me, was having everybody tell me how great they felt to turn 40, and how easy it was for them. I think it’s okay to feel the pangs of time passing. Anxious aging people everywhere, I absolve you! The other night while we were at the shore, and I had my usual not-in-my-own-bed insomnia, I was half awake and listening to the waves, and this metaphor crept into my head. I’ll share it with you! It’s an extended metaphor, and I’m going to go on about it for a really long time, so I get extra points on my essay. Aging is like being in the ocean. You bob along, from day to day, treading water. You see your family on the beach, bright, and real, and busy and playing in the waves that wash towards them. You feel the sand under your feet slipping away, a little more with each wave, but it’s not unpleasant. Every once in a while you step on a sharp shell or get pinched by a crab, but the waves carry the sharp thing away again, and you bob and and you tread. The vasty ocean curves all around you, beautiful, comforting, frightening, inexplicable. And you’re fine; you’re lifted up, you’re set back down, you’re happy. And then when your back is turned a giant wave comes and breaks right over your head, you’re not ready for it, you’re turned upside down, your mouth and eyes and ears are full of water. But you struggle to right yourself, to see your family on the glowing sand, you clear your soggy head, you tread, you bob, you’re fine. The older I get, the more I realize it’s the small everyday things that matter. Today we’re making a cake, and Malcolm drew me a card with green and blue Dog Woman on it, and Isaac drew me a card with a picture of him and me laughing. The sun is shining, the day is cool. Yesterday I went to a grocery store with my boys, but it was a special grocery store, and I got special things, and they’re full of happy potential for good meals. We’re all on the same boat together going in the same inevitable direction – we may as well enjoy the meals! One of the nice things about having a summer birthday is the vegetables. I LOVE VEGETABLES!! Yesterday I made a sauce with roasted tomatoes, roasted beets, roasted zucchini, tons of fresh basil, a pinch of marjoram and thyme, and a few of my special birthday purchases – viz, sherry vinegar, fresh mozzarella, and pinenuts. I think it turned out really nice! A little beet-sweet, with the subtle tang of sherry vinegar. We had it with penne, but it would be good with anything, I think. It would even make a good soup, if you added more water or stock! Here’s Tom Waits’ Time, surely one of the most beautiful songs ever! Preheat the oven to 350. Cut the tops off the tomatoes, where the stems attach. If they’re very seedy, squeeze the seeds out. Arrange them next to each other in a medium-sized roasting tray. Drizzle 2 T olive oil and 1 T sherry vinegar over them, sprinkle them with salt, and pop them in the oven. Put the garlic clove, still in its pierced skin right in with them. After about half an hour, add the beets and zucchini, and shallot. Spread them on a baking sheet, drizzle a tablespoon of olive oil and a dash of vinegar over, and mix well. Throw the marjoram leaves and time sprigs on top. Pop them in the oven and roast, stirring occasionally for about half an hour. During this time, poke the potatoes with a spoon from time to time to break them up a little. Tip the beets and zucchini in with the tomatoes and one cup of water (You can transfer them to a bigger roasting pan if you need to!) Turn the oven up to 425, and continue to cook for about 45 minutes, till the tomatoes are soft and melty. Take the tray out of the oven. Squeeze out the garlic and mix it in. Add the thyme leaves, and ditch the stems. Add the butter, salt and pepper. Purée in a blender just as much as you like. I did 2/3. That way the sauce got nice and pink and smooth and bright, but still had some texture. Put the sauce into a big bowl. Stir in the basil and mozzarella, and top with the pine nuts. 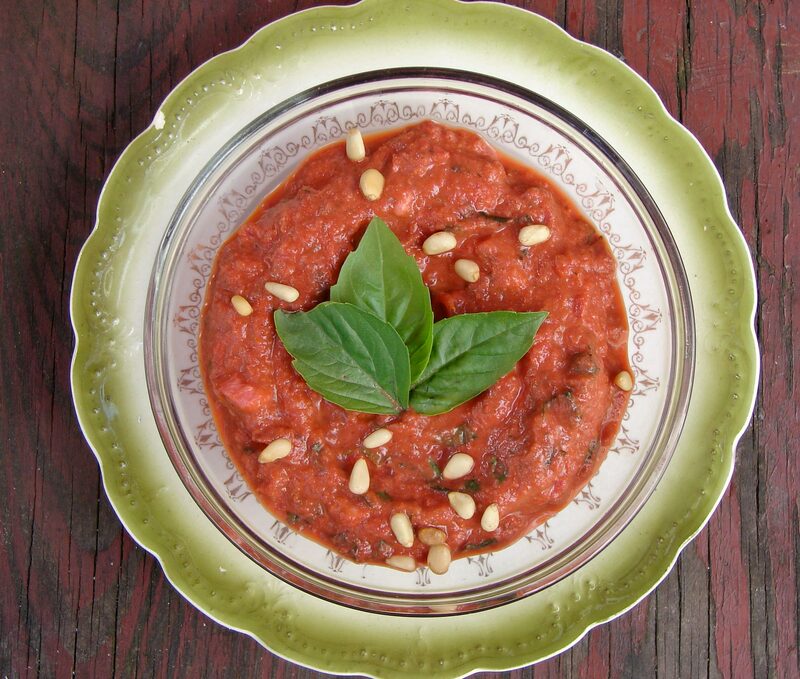 This entry was posted in recipe, sauce, Uncategorized and tagged beets, fresh mozzarella, pasta sauce, pine nuts, roasted tomatoes, sherry vinegar, zucchini by Claire. Bookmark the permalink. I think we do stay young in our heads! That’s why it’s so bewildering to see what’s happening to our bodies! Thanks, Liz! We did have a lovely day! I love your sea metaphor.